“Long” time ago I’ve written a Applescript for TP2 in order to add a auto numbered tag to a line. This script adds an issue Tag to the selected entry. The value of the Tag will automatic increment based on the latest numbered issue. Because the items are ordered by priority (not by ‘issue’ number) I check the complete document. The script runs via Keyboard Maestro. Because the manual for scripting is not completed yet, I’am not able to translate this script for TP3. So I hope someone here can help me! Perhaps something like the script below ? // and trawl for their highest value.
) + 1 // add one to the final max. Thnx, your script is already working!! The only thing I mis is the check if a issue tag already exist.In that case the script should not be executed. You too, really thnx! Works great! I posted mine after yours. And I’ve already changed my script about 3 times fixing various bugs. But this actually brings up a recent API change that can make future scripts a bit simpler. 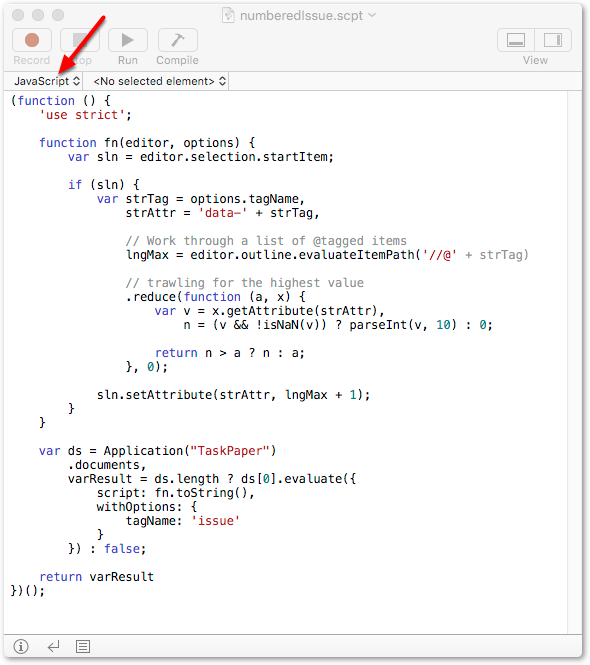 In your script you are checking the result of item.getAttribute() for Number vrs String values. As of a few versions ago this check isn’t needed, all values stored in item Attributes will always be stored as string values. So you always get strings! If you set an attribute using a non-string value then the value is converted to a string for you before being stored. For some types of objects (Numbers, Dates) TaskPaper also supports reversing that transform for you. To do this you can pass the object class that you want when using item.getAttribute(). See my updated script above. The reason that this is done is so that scripts won’t get tripped up when an outline is serialized. Serialization always turns all values into strings… so now that’s no longer a special case to be aware of, because those values are always stored as strings anyway. Thanks ! That does make things simpler.